Kelley Paul, wife of Sen. Rand Paul (R., Ky.), blamed Sen. Cory Booker (D., N.J.) in an open letter Wednesday for encouraging violence directed toward her family and those of other lawmakers. "My husband, Rand Paul, and our family have suffered intimidation and threats," Paul wrote. "Someone posted our home address, and Rand's cell number, on the internet," she wrote. Police arrested a former Democratic Senate staffer on Wednesday for uploading information about Republican senators to the internet. Paul framed her piece as "An open letter to Senator Cory Booker." 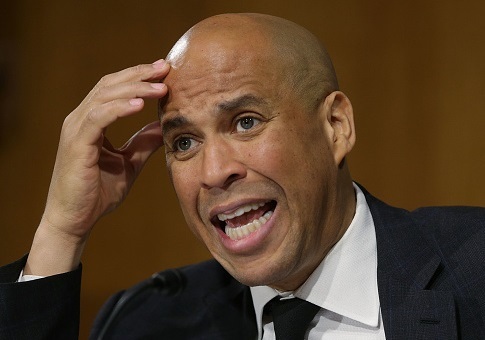 She shared that her home has required added security following recent events, and she accused Booker of encouraging protestor violence and endangering her husband's life. She traced the emboldened protestors back to comments Booker made in July. Speaking in Washington, D.C., Booker urged citizens to "go to the Hill today" and take active measures. "Please, get up in the face of some congresspeople," he said. Police regularly patrol outside Paul's home, she's expanded her home alarm system, and has taken to sleeping with a loaded firearm, Paul said. Senator Paul was assaulted in November 2017, when Rene Boucher, a neighbor, attacked him on his property and broke six of his ribs. He suffered lung damage and multiple bouts of pneumonia as a result, although Boucher maintained the attack had nothing to do with politics. In her letter, Paul named those who made light of violence against her husband, including MSNBC reporter Kasie Hunt, Kentucky Secretary of State Alison Lundergan Grimes, and others. Grimes, a Democrat, is accused of misusing voter registration information in hiring state employees. Kentucky's Attorney General today appointed a special counsel to investigate the allegations against Grimes. "I hope that these women never have to watch someone they love struggle to move or even breathe for months on end," Paul wrote. The senator was also accosted by protestors while in an airport earlier this week. "Preventing someone from moving forward, thrusting your middle finger in their face, screaming vitriol — is this the way to express concern or enact change?" Paul asked in her letter. "Or does it only incite unstable people to violence, making them feel that assaulting a person is somehow politically justifiable?" Paul appealed to her husband's working relationship with, and shared respect for, Booker. "He respects you, and so do I. I would call on you to retract your statement. I would call on you to condemn violence," she concluded. This entry was posted in Politics and tagged Cory Booker, Kelley Paul, Rand Paul. Bookmark the permalink.